Tetanus is an acute infectious disease characterized and tonic clonic spasms, especially chewing and extensor back, the toxic lesion of motor cells of the Central nervous system. poison tetanus bacteria. Etiology. The causative agent of tetanus anaerobic spore-coli You. tetani), mobile forms a powerful exotoxin, which affects the nervous system. Epidemiology. The causative agent of tetanus easily multiplies in the intestine of animals and humans. Getting together with animal waste into the soil, tetanus bacteria into disputes and are accumulated in large quantities. They are found in the soil of forests in analoginiai soil gardens and so on, They can dust to get into the dwelling, clothing, shoes, and persist in the environment for many years. The incidence of tetanus associated with injuries. In peacetime, tetanus occurs sporadically and mostly in agricultural and street injuries, as well as childbirth and abortions performed in unsanitary conditions. The greater incidence of tetanus was noted during the wars. In the years of the great Patriotic war tetanus rarely seen by the wide preventive measures. For penetration sticks tetanus in the body rather small scrapes or scratches. Pathogenesis and pathological anatomy. Tetanus spores, once in the wound, develop in bacteria, having the form of sticks, which are exotoxin. The bacteria remain in place of introduction, and the toxin through the nerve trunks enters the Central nervous system. and in the blood that causes the disease. The dead tetanus pathological changes usually are the same as in cases of death from asphyxia: swelling lungs, point bleeding of parenchymatous organs and on mucous membranes, the plethora and swelling of the brain. In skeletal muscle observed necrosis. 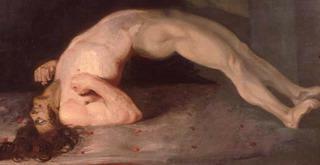 Characteristic posture of the patient tetanus cramps (opistotonus). The clinical picture. The incubation period is from 2 to 40, often 4 to 14 days. The shorter the incubation period - when shot in the head or neck. The shorter the incubation period, the harder the disease. The disease begins gradually, sometimes it is preceded by dragging pain in the area of injury. Early symptom is difficulty opening the mouth - lockjaw (see)arising from twitching masticatory muscles. With strong muscles patient is not able to open her mouth. Then there are the convulsions of facial muscles, the patient's mouth stretched, producing the impression of a smile, eyebrows raised, on the forehead appearance of deep wrinkles. This expression is called "sardonic smile" (risus sardonicus). Gradually convulsions capture the different muscle groups. Throws back his head, the body is curved arc, the patient relies on the bed of her head and heels - opistotonus (Fig). The abdominal muscles become stiff as a Board. Much less tonic seizures expressed in the muscles of the limbs. Seizures and convulsions occur, with full consciousness of the sick and so it is especially painful. In some cases, seizures capture and respiratory muscles - there is shortness of breath, cyanosis, long breath, leading to death. In connection with increased excitability of Central nervous system. cramps appear under the influence of noise, light, touch, talk, when you try to swallowing and urinate. Along with the tonic observed and clonic convulsions (see). The temperature may be normal or low grade, in some cases, tetanus occurs with high temperature. Characterized by excessive sweating. There are also atypical forms of tetanus: a lightning - leaking badly and very hard, ends with death in 1-3 days; acute - is less turbulent flow, convulsions occur 2-3 day from the beginning of the disease, the disease usually severe, but there may come recovery; subacute form - it occurs at prolonged incubation period and is characterized by the slow development of clinical manifestations of disease, convulsions rare and short, sweating insignificant, often leads to recovery; chronic form - muscle rigidity develops slowly, convulsions not occur, the disease lasts for months and ends recovery; local tetanus is characterized by the appearance of cramps only in the muscles, located close to the site of tissue damage. Complications are divided into early and late. Early complications tetanus associated with acute stage of the disease include: spasm of the esophagus, urinary retention, as well as developing pneumonia due to difficult expectoration of sputum and inhaling her sudorozhnom reduction of respiratory muscles. By late complications include the contraction of muscles and joints, degenerative changes in the liver, kidneys, deformation of vertebral fractures due to their while seizures and convulsions.